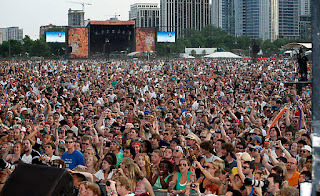 Lollapalooza 2008 also had 75,000 viewers. 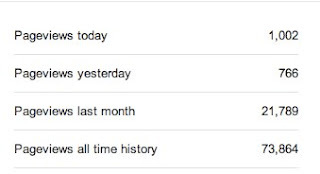 I started to get ready to introduce everyone to Twizzlefizzlepop, the gnome book pimp who will be joining us here on Writing About Writing to pimp out the occasional book, when I realized that today we're going to go over 75,000 page views. Which, as awesome and pimptacular as Twizzlefizzlepop is, is simply not a bellwether we can pass quietly--or with only a Ben Stein caliber shout out--even though he has his ear hair in dreadlocks and an engineering specialization that lets him invent auto-page turners and stuff. Visual proof of epic awesomeness. I mean this is like the entire population of Mountain View (where Google is headquartered) clicking on my blog. From the Google employees to the soccer moms to the retirees. This is like the active military forces of Lybia and would be bigger than the armies of Canada, Australia, or The Netherlands. Not that I would send a bunch of gentle writers up against the untamed fury of the Dutch armed forces, mind you, but just by way of comparison. And even though I'm past the point where I'm making a triumphant post every time I make another thousand views, or even 10,000 views, this one calls for something a little special. So instead, I'm going to take today to tell you all how awesome you are! I kicked off Writing About Writing in February of 2012 (technically it was the tail end of January, but only by a couple of days). Back then I was primarily on Facebook asking my friends to come and check out my blog, and I'm pretty sure most of them did it either to be good, supportive friends or just to see what I was up to. The number of people among my friends who A) are interested in writing and B) don't know as much or more than me about it is quite small. Some of my tech writer friends might learn a thing or two about the craft of fiction, but I'm not telling someone who writes for a living anything too insightful when I bang my pots and pans about writing every day. I'm pretty sure most of them thought I was either stupid or insane, likely both. I had a lot of friends over the next few months say within a few seconds of running into me "I don't read your blog," like they felt guilty and wanted to get that off their chest right away. Sometimes they even added a small shrug or an "I'm sorry," to that. And even though I never felt anything but head-spinning euphoria when a friend said "I LOVE your blog,"it was always really okay if my buddies were not quite the W.A.W. niche. So back then, I was pretty happy if I pulled in over twenty hits a day. I'd get forty or fifty hits if I savaged Prometheus because my friends could read between the lines or ignore the writing advice to get to get at the jokes. 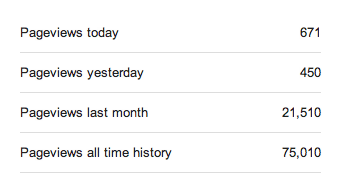 But I thought it would probably be a year before I broke 10,000. I thought it would be yearS before I got anything like 75,000. I don't mean I didn't have my idle fantasies where I wrote a post that took the world by storm and my average day consisted of deciding the balance among doing talk show interviews, meeting patrons who wanted to throw money at me, having blistering hot groupie threesomes, and writing more brilliant stuff. But when I thought realistically about where things were going and how long I could reasonably expect to take to get there, I never in my most reasonableish dreams(wildest maybe but not reasonablish) thought I would come this far, this fast. These days I'm averaging around 700 page views a day and extra awesome days like this have happened more than a couple of times in the last month. It takes my breath away every time I think about it. And it's all because of you. As much as I put myself on social media and say "Check me out. No seriously check me out," in my best Strong Bad impersonation, there is simply no way I could have gotten to this point without all my friends hitting their tolerance of my self-promotion, grabbing torches and pitchforks, and marching on my house while singing "Kill the Beast!" The reason I can look at this before I've even reached my one-year anniversary is that all of you rock beyond the telling of it. You've put articles you liked on Reddit or Digg. You've mentioned me in other places and to other writers. You've boosted the signal. 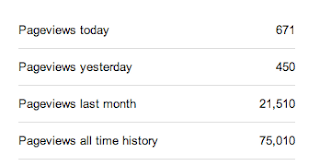 And though I have a long way to go before I can claim blogging is a "real" job, I couldn't have gotten to this point in such a short amount of time if I didn't have wonderful and awesome readers. You all are the bomb. Which is weird since that's a definite article and I'm using it to describe thousands of you, but it is still true. You are THE bomb. All of you. Just found you recently, so I'm not very many of these hits, but congratulations.